Go to System > Configuration > Pdf Print-outs> Picking List to configure your picking list in Magento. Enter a title for the picking list. 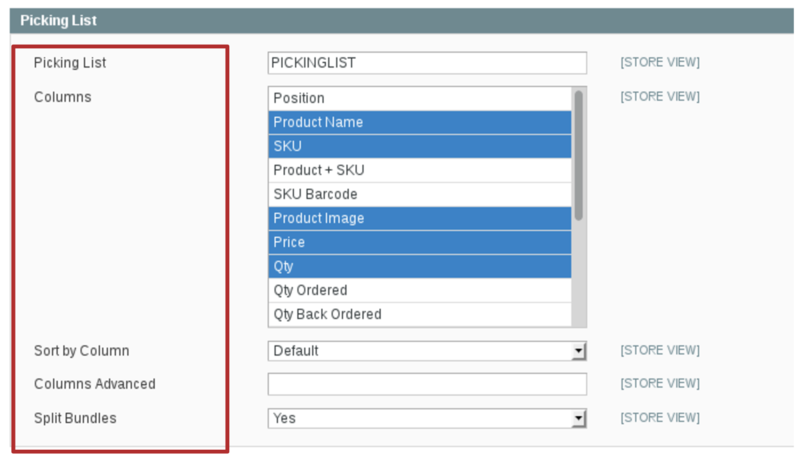 Control-click to select the attributes that you wish to display as columns on your picking list. There is no maximum number, but the more columns you select, the smaller they will become in order to fit on the same page. If you want to use custom attribute columns, make sure you have first enabled these under your “Pdf Customiser by Fooman Settings” settings. Choose which column to sort items by (alphabetical/ascending order). The default setting retains current Magento settings. When set to “Yes”, bundle Items will be listed individually and combined. If set to “No” only bundles with the same items will be combined for picking.